We just received official word from U.S. Cellular that they will be launching their Galaxy S series handset, the Samsung Mesmerize, on October 27th. Much like the phones offered by the bigger carriers, it features a 4-inch AMOLED touchscreen, a 1 GHz Samsung Hummingbird processor, virtual QWERTY keyboard with Swype, and a 5 megapixel camera/camcorder. 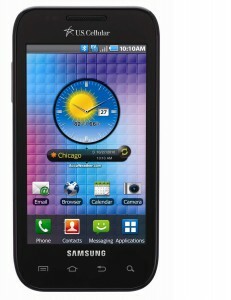 And just like the top providers, U.S. Cellular will drop this Android 2.1 phone with a $199 price tag (after $80 mail-in rebate) later this month. According to our contact, the Mesmerize will see Android 2.2 this year! CHICAGO (October 6, 2010) – Just days following the announcement of U.S. Cellular’s series of industry-first, customer-focused initiatives called The Belief Project, the carrier confirmed the Oct. 27 arrival of its next Android-powered device, the Samsung Mesmerize (SCH-i500). The Mesmerize is part of Samsung’s line of Galaxy STM smartphones and is the third of five smartphones the carrier is launching this year that run on the Android platform. U.S. Cellular will roll out the LG Apex in November and the LG Optimus in December. U.S. Cellular’s growing catalog of Android-powered phones is a key part of its strategy to deliver cutting-edge devices while elevating the customer experience. The Belief Project was developed to fix the frustrations wireless customers have with their carriers, one project at a time, with innovations like “One and Done” contracts, a robust rewards program, simplified national rate plans and the industry’s only phone replacement program. U.S. Cellular’s new simplified National Single Line and Family Belief Plans offer affordable bundles of voice, text and data. Customers who choose a Samsung Mesmerize can opt for the Premium Plus Belief Plan, which includes unlimited voice and text with 5GB of data, along with U.S. Cellular’s industry-leading Overage Cap and Phone Replacement programs. The Mesmerize features a brilliant 4-inch Super AMOLED™ touchscreen, making it easier to play games and watch movies in bright environments. Its 1 GHz Samsung Hummingbird Application processor speeds up downloads and uploads, and produces high-quality 3D graphics and multimedia content. Samsung’s All Share application allows customers to send video, audio and pictures from their Mesmerize to other DLNA-enabled devices, like TVs and computers. The Mesmerize comes with a virtual QWERTY keyboard with Swype technology, allowing customers to input text quickly by sliding their finger over the keyboard in one continuous motion. It also features six-axis motion sensing for responsive gaming, Samsung’s Social Hub, a 5 megapixel camera/camcorder that records video in HD, MP3 player and 3.5 mm headphone jack, WiFi, Bluetooth 3.0 and expandable memory up to 32GB. The Samsung Mesmerize will retail for $199 after an $80 mail-in rebate and will be available Oct. 27 at U.S. Cellular locations and at uscellular.com.